Eleven years ago a good friend of mine plucked up her courage and invited me (a piece of “hard rock” as I called myself then) to attend the first Alpha Course organised by her church and the rest, well as they say, is history! Throughout the years after that fateful weekend halfway through the course when I accepted Christ as my personal Lord and saviour, I have always been, and still am more than happy to accept any invitation to give testimony during any Alpha event (primarily to encourage guests to sign up for the Alpha Course) on how my very limited knowledge on Christianity was broadened from the systematically and non-threateningly conducted Alpha Course and how I was subsequently transformed from a hard-headed, impatient, demanding, aggressive and almost an atheist to someone who is today a lot more patient, at peace and joyful, and who calls Jesus the centre of her life. 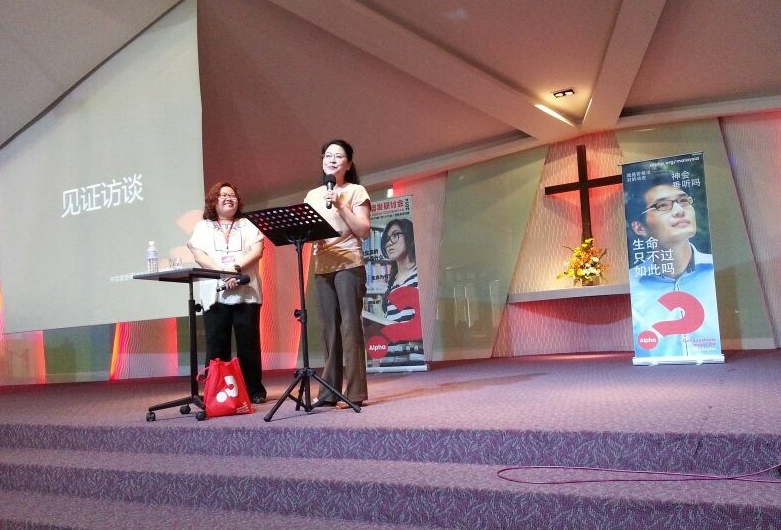 I was invited to give a short testimony yesterday during the Chinese Alpha Conference organised by Alpha Malaysia. This time it was different from my usual encouragement to the guests of the course as I stood there as a fruit of the Alpha to reaffirm a known fact as well as to give encouragement to the leaders of the churches who have organised or are going to organise Alpha Courses that the course truly is one of the most effective and powerful tools to bring people to Christ! It was such an honour, and a joy testifying to the Lord’s goodness!